An owner of a vintage, upright piano has the privilege of playing music on an instrument that was built around the same time that the first Model T Fords were roaming the countryside! With proper maintenance, upright pianos a century old or even older may be enjoyed daily, and have the potential to perform and sound as beautiful as the day they were built. “Planned obsolescence” was definitely not an idea that had occurred to the builders of these wonderful instruments! They were built to last! 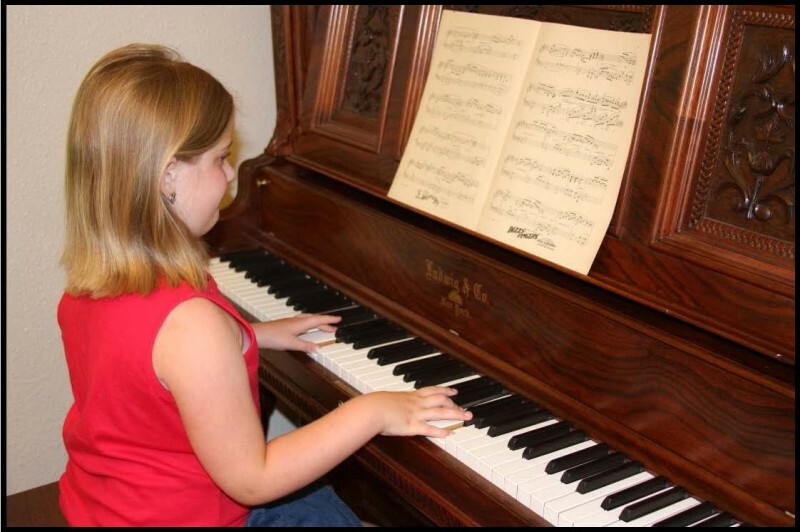 Sitting down to play on a freshly tuned upright piano is a wonderful experience for performers of all ages and ability levels! Tuning: With any acoustic piano, following a regular tuning schedule is essential for the piano to perform up to its potential. 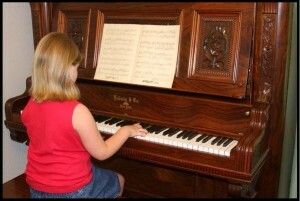 All pianos go out of tune over time because of a variety of factors such as seasonal swings in humidity levels. An important key to a piano sounding its best is to keep it in proper tune by having it professionally serviced on a regular basis. An adequate tuning schedule for a piano being used on a regular basis is a onceayear tuning, usually scheduled for approximately the same time of year each year. For the piano that is being played heavily, a semiannual or quarterly tuning would be better yet. For a piano currently not being played but which is being maintained for future use, a tuning every other year will usually suffice. Letting an piano go for longer than two years without tuning, however, is not recommended. 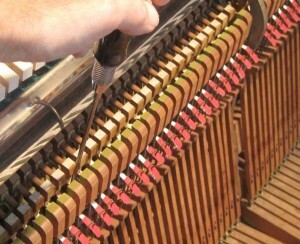 Repairs: An upright piano action has thousands of individual parts, and after decades of use, breakage may occur or parts may simply wear out. The good news is that most of the parts found in an upright piano action (the working mechanism) do not often break (even after a century or more of constant use! ), and those parts that do happen to break or wear out may often be replaced with parts available to the professional piano technician, or repaired to likenew condition. 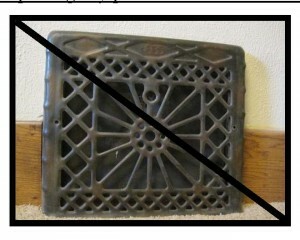 One example of parts which commonly needs to be replaced on a vintage upright piano is the bridle straps, shown in the photo to the left. 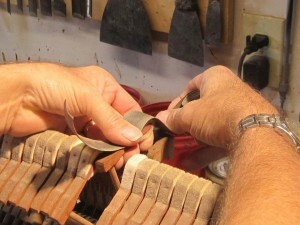 These straps are essential for holding the bottom of the action up when it is removed from the piano for servicing. The best procedure for replacing parts which have started to break is to replace the entire set in order to avoid future problems. 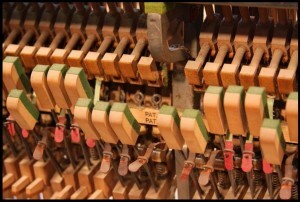 In the case of the piano action shown in the photo above, a previous technician had only replaced the straps which were broken at the time—the new bridle straps being those with the red tabs. The problem with this approach is that the remaining original straps will still be prone to breakage, ending up in a situation where more replacements are needed. On the other hand, when an entire set of parts is replaced (see photo right), future repairs in the foreseeable future will not be needed. The problem is solved, once and for all. This approach is therefore recommended whenever possible. 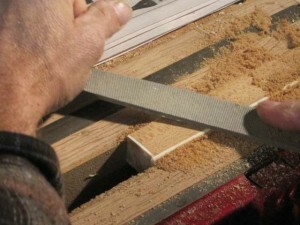 Hammers are being carefully shaped in the photo to the left to remove cut marks caused by strings. This will result in an improvement to the tone of the piano. In cases of severe wear, replacement of the hammers may be a better option. Original ivory in good condition on a vintage upright piano is a definite plus. A few chipped keys may oftentimes be replaced or repaired. 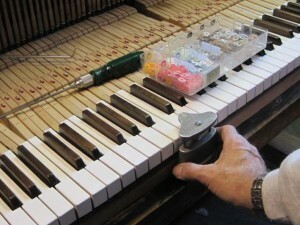 In cases where the old keys are badly worn, however, installing a new set of keytops (shown being fitted to the keysticks) will benefit the appearance of the piano. 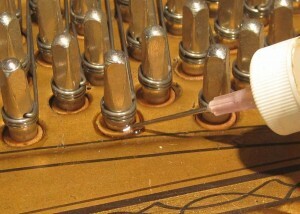 The application of a pin tightening liquid to loose pins will in some cases improve tuning stability. When pins are extremely loose, the installation of larger tuning pins might be more effective. 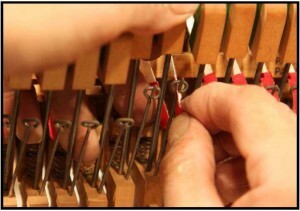 Regulation and voicing: For an upright piano to perform at its peak, the first step is to get it into tune, and to repair all broken or worn parts. When this has been done, the piano is ready to be “regulated” and “voiced.” Regulation refers to the procedure of adjusting all the moving parts of the piano action so that the mechanism is performing in peak form, with no wasted motion. Voicing refers to evening out and improving the tonal quality of the piano by making careful adjustments to the hammers of the piano. 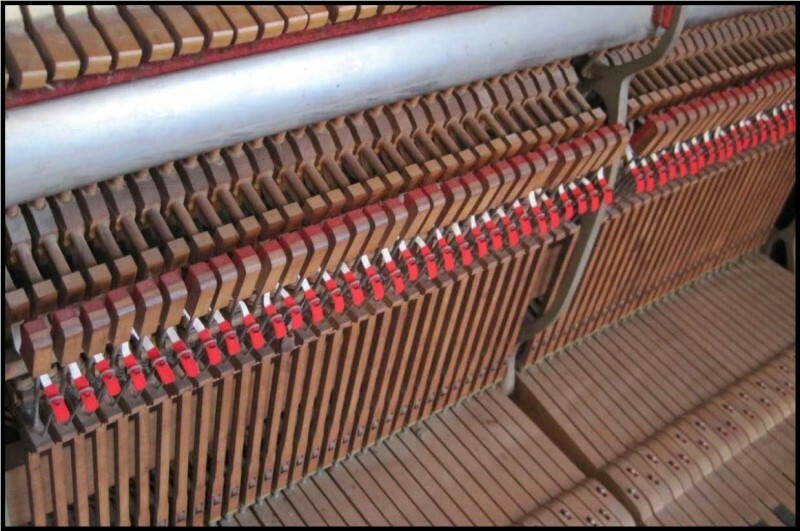 When an upright piano is in perfect regulation, each hammer is propelled almost all the way to the strings by the action. At the last possible moment, the hammer is released to strike the strings under its own momentum. In the photo to the right, adjustments are being made to ensure that the hammers release at precisely the right moment. An unwanted quantity in the operation of the piano action is “lost motion,” or wasted energy. In the photo to the left, lost motion is being taken up by the careful regulation of brass capstans. Perfectly level keytops give an upright piano more of a “new” feel when played, and are essential for a piano to look its best. 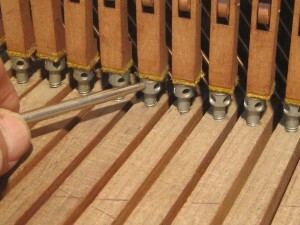 In this photo, a set of upright keys is adjusted to a tolerance of .002 “. 1. 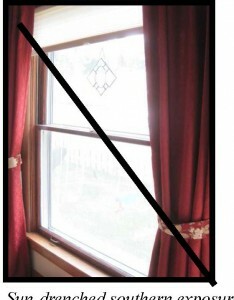 Hot air registers—dry, heated air blowing directly on the back of a piano is particularly bad for the soundboard. 2. Sundrenched southern exposures— again very hard on the piano. Note: Effective humidity control equipment, either for the home in general or the piano in particular, will aid in keeping an upright piano in top form. In conclusion: To keep a vintage upright piano performing at its best so that everyone who sits down will enjoy their musical experience, it makes sense to come up with a plan for maintaining the piano which fits both the budget and expectations of the owner. If you would like, I would be happy to schedule a time that we could sit down together and go over the specific repairs your piano would benefit from and come up with a plan for a regular maintenance schedule for tuning and regulation. A newly repaired upright piano action, installed and ready for regulation.